IRVINE, CA--(Marketwired - Jul 15, 2014) - Bivar, Inc., a leading specialty manufacturer of quality products and solutions that enhance the value of high technology, announces the UDD series of Universal Conductive Snap-In Card Guides. This new series is ideally suited for mounting printed circuit boards (PCBs) and panels in enclosures and systems with both standardized and unique depth requirements -- including computers, datacom/telecom, factory equipment, industrial controls, defense and military. To answer growing concerns in electromagnetic interference, radio frequency interference and electromagnetic contamination applications, the UDD series features a choice of two pre-installed clips. The conductive stainless steel clips provide integrated grounding contact from the PCB to the chassis and will not corrode, oxidize or react with most chemicals/solvents in the assembly process. The static dissipative clips offer anti-static protection for the enclosure system with an ESD protective coating to provide surface resistivity. "Bivar has been actively seeking the development of a card guide that addresses the challenge of providing ESD protection for static sensitive components during the insertion and removal of printed circuit boards while also providing greater design flexibility," said Tom Silber, Bivar president and CEO. "This new Universal Conductive Card Guide series meets that challenge with a unique retention feature provided in a deep channel card guide design. Available in a variety of lengths, the UDD series is an excellent option when used in high-vibration applications." UL Rated 94V-0 precision molded nylon is strong and economical, while providing ruggedized performance with minimal friction during the insertion and removal process. Accommodates various PCB board sizes and offers a wide selection of lengths to cover most standard and custom subrack depths (2.0"-11.0", in 0.5" increments). PCB channel depth of 0.200" (5mm) offers greater design flexibility and reliability, as well as excellent retention for high-vibration environments. Tapered guide entry on both ends and press-fit mounting pylons for simplified and secure installation and insertion with no tools required. Pre-installed conductive or static dissipative clips provide either grounding or ESD protection, respectively. 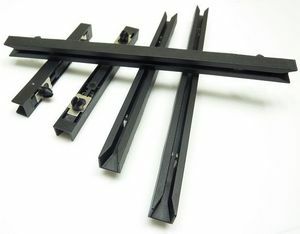 For more information about the UDD series, please visit www.bivar.com. For application assistance and samples, please contact Bivar Sales at sales@bivar.com. Bivar, Inc. is a leading specialty manufacturer of Enclosure Hardware, LED Indication, and LED Lighting solutions that enhance the value of high technology. Bivar's products display practicality and are designed to meet the increased demand for new technology across a growing range of applications. Bivar is known as a trusted provider with a broad range of expertise, and a long-standing history of quality and innovation in the electronics industry. An employee-owned company, Bivar's corporate headquarters is located in Southern California, with manufacturing in Irvine, California, USA, United Kingdom and China. Bivar is widely supported by a highly-qualified network of authorized representatives and distributors. For more information, please visit www.bivar.com or you can follow us at Twitter, YouTube, Facebook or LinkedIn. Bivar’s UDD series of Universal Conductive Snap-In Card Guides are ideal for mounting printed circuit boards and panels in enclosure applications. Pre-installed conductive or static dissipative clips provide either grounding or ESD protection.